Way down here in Kiwi-land, things are cold. We’ve got snow on the hills, wind blowing up from Antartica, and the inevitable winter rains. 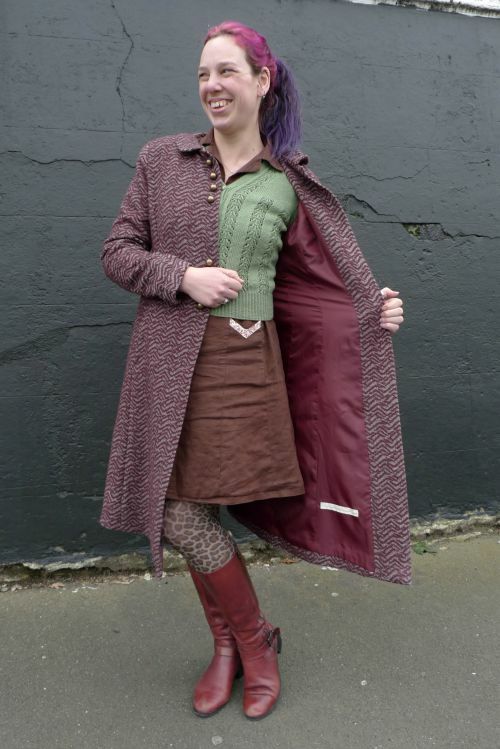 Which makes it the perfect time to sew up a warm, snuggly coat! 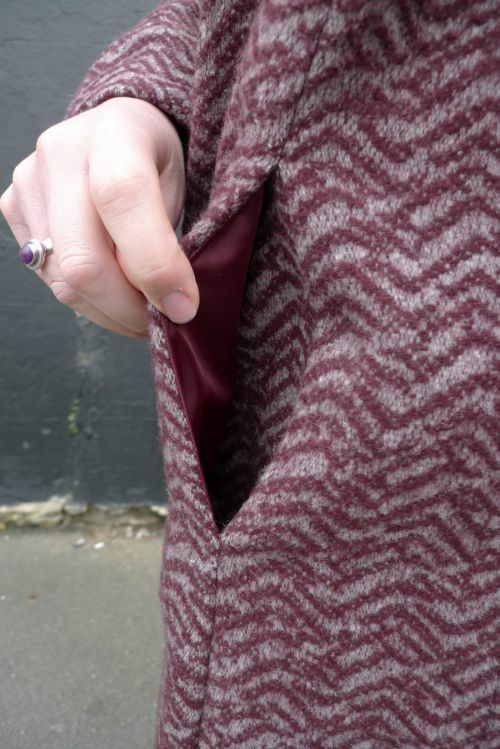 I spotted this gorgeous chevron design coating fabric on the Minerva website a while back, and then spent a couple of months selecting and discarding patterns to use with it. 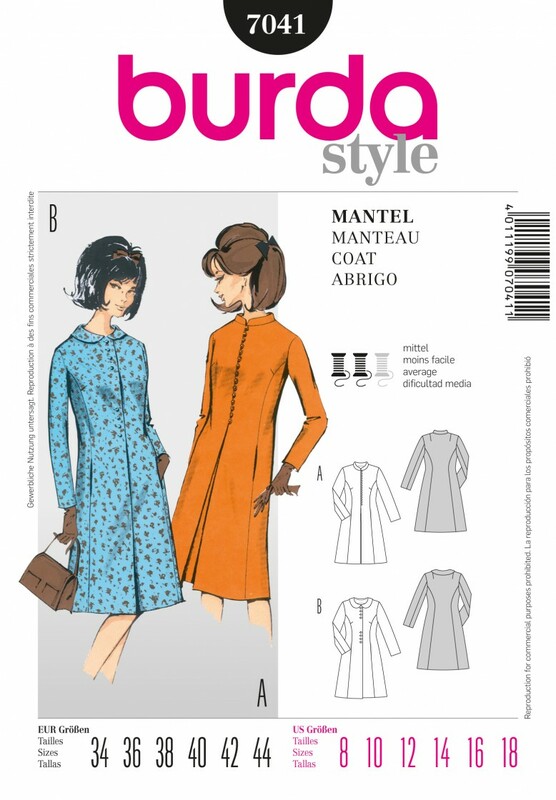 Finally, I spotted this reproduction 1960’s coat pattern from Burda, Burda Style 7041 – perfect! 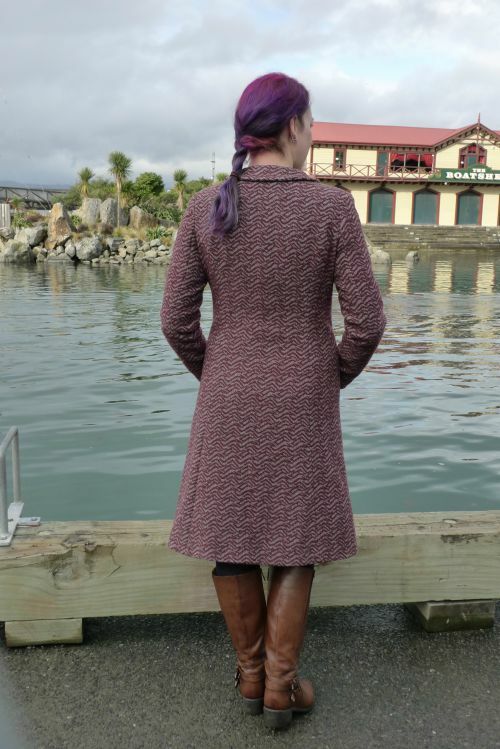 I really like the details of this pattern – it’s got princess seams from the armscye in front and back, and a classic tailored two-piece sleeve. The princess seams don’t quite go over the bust apex in the front, so there are small angled bust darts for added shaping. There are also two pockets in the front princess seams. One thing I didn’t spend long debating on was which view to make up. A Peter Pan collar on a 1960’s coat? Say no more! 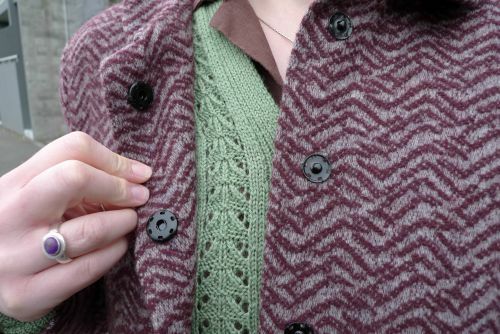 And as for the fastenings – that set of two lots of four buttons is just too lovely. This was my first time making up a Burda envelope packet. 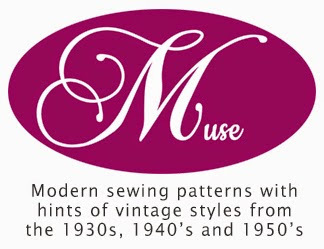 A very different experience to making up any of the Burda magazine patterns, that’s for sure! Overall, it was fine – not the most comprehensive instructions in the world, but it came together nicely. I did spend quite a while at the start hunting for the measurement chart though to figure out what size to cut – finally located it on the pattern tissue. Not my favourite place for those charts to be…! I was a good little sewist and stitched up the bodice as a muslin beforehand. (Mainly because I knew I’d have to make a couple of adjustments, so wanted to check I got them right. Hah!) Sure enough, a few changes were made. I ended up lengthening the sleeves by 7cm, which then became more like 8cm after attaching the lining (I have super long arms, and I think this pattern has wrist-grazing sleeves rather than full length). The shoulders were widened by 1cm. And I moved the bust dart down by 6cm (which in hindsight was about 2cm too far, despite my careful marking on the muslin. Not sure what happened there.). For most of the construction, I actually followed the instructions. Except for when it came to the lining – it called for hand-stitching the hem and sleeve hems, then hand-stitching the lining to them. I’m not a huge fan of hand sewing. 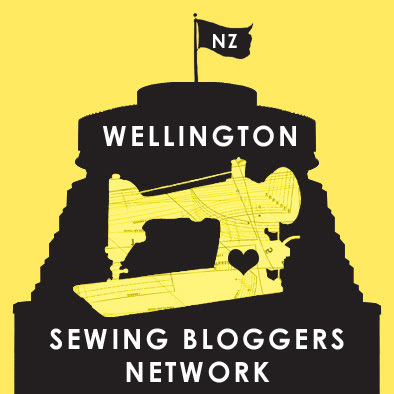 So I just bagged the lining out instead – far easier and faster! (And yes, it meant I lost the little ease fold at the hem of the lining, but since I pre-washed both fabric and lining, I felt this was an ok loss to make.) As a result of bagging the lining rather than hand-catching it to the fabric, the hem and sleeve ended up about 1cm longer than they would have otherwise. Now, let’s talk about some of the project details! The lining is just your classic anti-static lining. 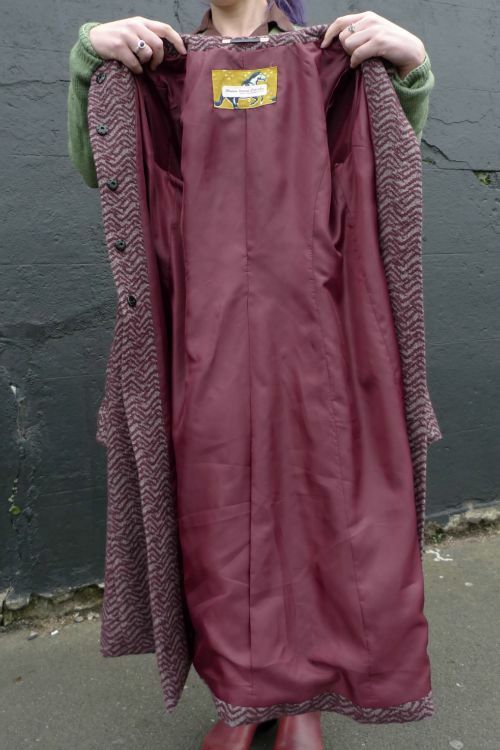 The coat is fully lined, and there’s an ease pleat right down the centre back. The lining is used in the pockets too – lining on the top of the pocket bag, fashion fabric for the bottom layer. This way, bulk is reduced, and since the bottom layer of the pocket bag is the only one you really see, it still gives a nice continuous flow of fabric. I added a coat hanger bar as well. To reinforce it and make sure it will bear the weight of the garment, I interfaced the back neck facing and also stitched two flat buttons directly behind the bar on the other side of the fabric – one button for each end of the hanger bar. They lie nice and flat, and now it’s all sewn together, you’d never know they were there. Good, hidden structural support! And to finish it all up, I added a couple of labels. 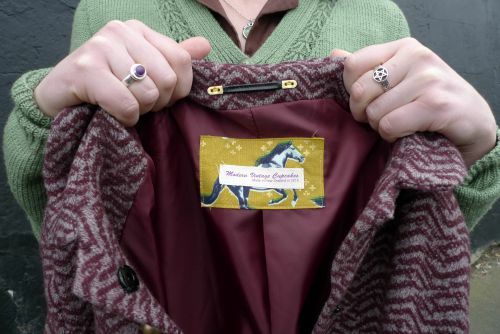 My own label on a scrap of Cotton & Steel mustangs print cotton (because, mustard yellow! Horse! 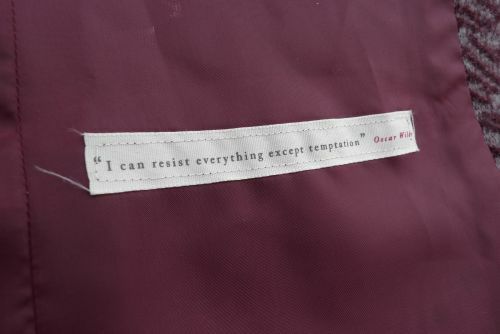 ), and an Oscar Wilde quote on ribbon near the hem, just for the fun of it. 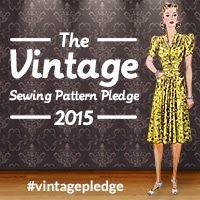 I’m considering this project a win – I’ve worn it every day since I made it. (Hence also why there are different outfits under it in the photos – one outfit from wearing it to work yesterday (thanks to my colleague Matt for taking pics! 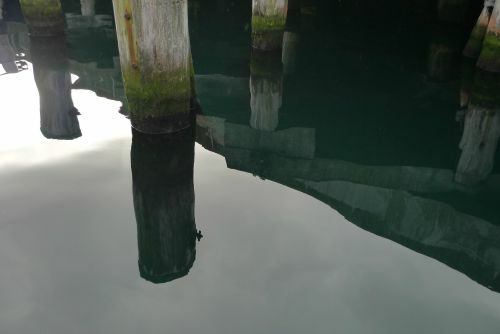 ), and one from today when we went wandering along the waterfront. And here’s a couple of other shots from our waterfront roam today, just because. 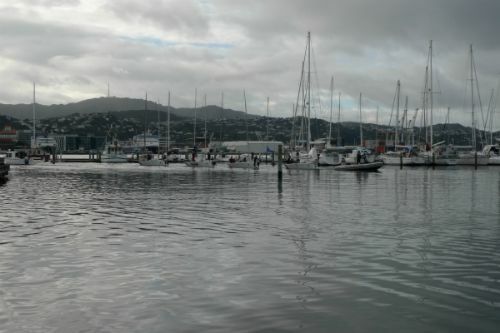 The view under part of the wharf, and the Chaffers Marina.